Do you really need a personal/business website if you are in the show? Many think they themselves are not regular internet users and how a website would help their business. The interesting factor is that 70% of the UK population have access to the Internet now! Today the 'Virtual Media' is the core of branding and the 'Content Development' is its key. We produce graphics and video for a great brand experience. We design, develop and maintain responsive websites, mobile applications, social media updates, blogs and digital presentations. 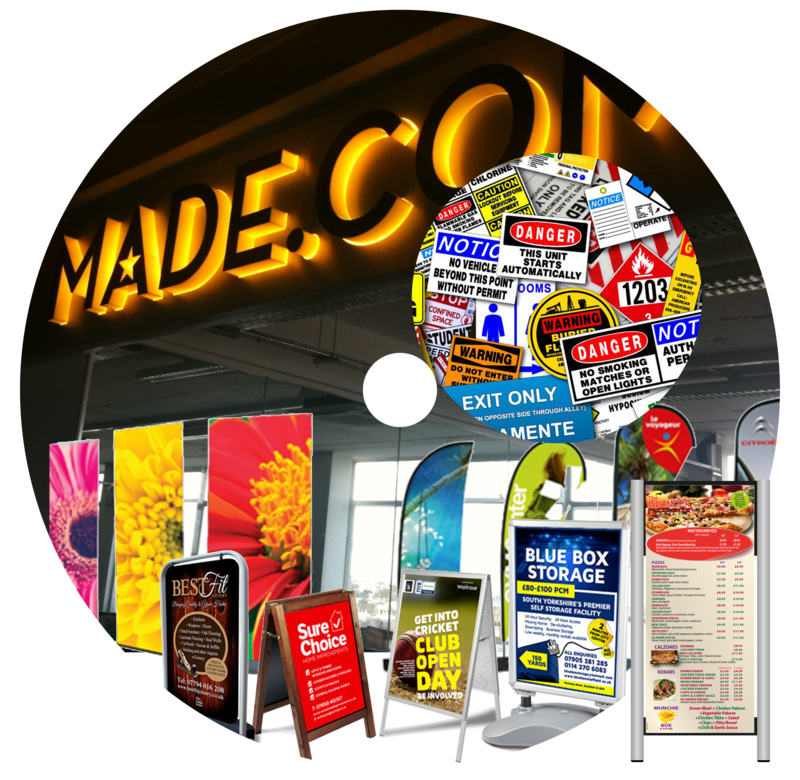 Our custom designs are aimed to maintain the uniqueness and personality of your brand in the media world..
Graphic Design is at the centre of sign making. Our cutting edge designs help you to create Interior Signs and Graphics, Exterior Signs, Shop & Company Signs, Building & Construction Signs, Custom Safety Signs, Large Format Digital Printing, Banners- PVC & Mesh, Vehicle Graphics, Education & Health Signs, Illuminated LED Signs, Event Signage..
Acuracy: It's a fallacy..but it works with us! You may be a technology marketer yourself or an employee looking for accurate data to generate sales or organise marketing campaigns or a B2B Data service provider, online or cloud based, want to empower your customers with accurate data. However, the ever changing nature of the data have been one of the challenges in deriving at quality results in the data process. To provide real time quality data, it has to be updated regularly. Online platforms does a handsome job in mining digital data, but what about the part of the world that is not yet connected or not willing to be connected digitally. How to bring these valuable data to the pipeline to be shared, visualized, analyzed and used intelligently! We are an intuitive animal, drilling to the grass routes of customer behaviour in the market! Our 'Leaflet Distribution Network' is a double edged sword cutting at laser-point accuracy! 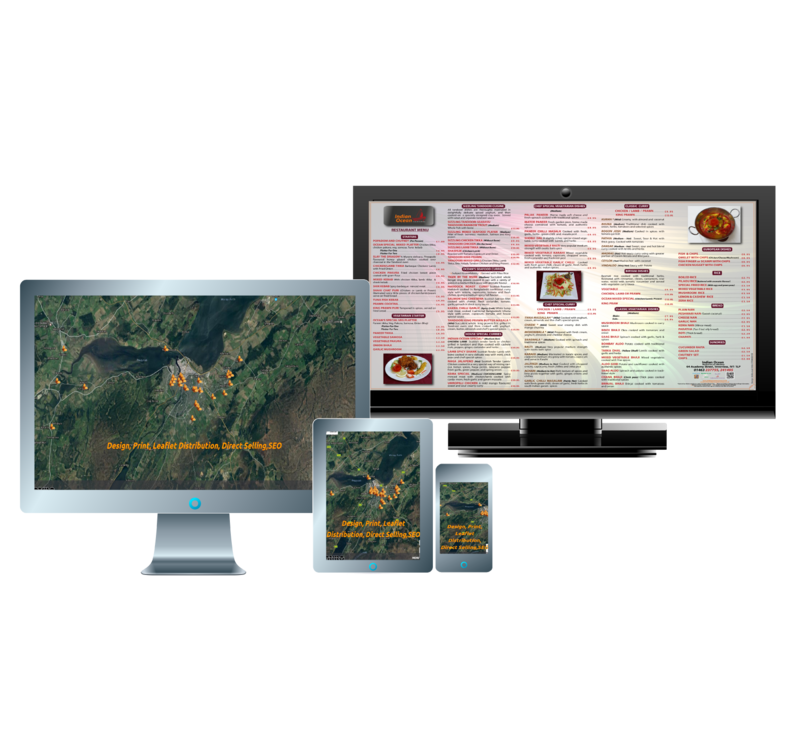 This Physical network of Franchisee and Contractors based on real time Terrain Map, from street to street and house to house, gathers and updates real time data legally and lawfully across Industry sectors and is shared with our clients globally! We integrate various data collection requirements in line with our Leaflet distribution campaigns. Physically collected data is capable of being verified on-site and the accuracy is at its height. We use this data for B2B, B2C and C2C campaigns and is shared globally. This method of collecting data for your specific objective is called 'Leads'. We compare our model demographic segmentation with your objective and collect data from multiple heterogeneous sources and make it available on your objective basis to analyse and meet your specific needs. Our Distribution Network drops your offers to the chosen demographic targets identified on various segmentations. We collect data from the feedback legally and lawfully and shares it with the Customers' consent which is derived on the basis of offers made. Every business is handling hundreds of service users daily! We collect these data with the lawful consent to be used legally for further customer care and promotions. We share them at B2C, B2B and C2C levels for E-mail marketing and Text message marketing campaigns. Every business today is bombarded with Data daily. You need to organize and document DATA appropriately to make some information and knowlege out of it! You can use them for Marketing and Customer care. Get new customers...Expand your base! Call us for details today! PH: 07904606159. The way We do it.. The geography of Scotland is varied, from rural lowlands to unspoilt uplands, and from large cities to sparsely inhabited islands. It is portrayed with a mosaic of 'Traditional Properties, Country Side Properties, Bunglows, Detached, Semi-detached, End Terrace and low number of Flats'. Demographic types such as age, gender and economic profile are used to drill deeper to get the best return from our Data Collection. We have a well trained and experienced team of distributors as Contractors, headed by Franchises as Supervisors. The team is responsible for the on-site collection of data in the designated campaigns. The franchisee is responsible for daily data documentation. Accountability is paramount to our work culture. We have Full time and Part time contractors working from their own residing territories. We appoint contractors in developing territories. Our Distribution network is based on custom made Route Maps. It is a practical alternative to 'GPS' and 'Random Map Generation'. The area is divided into 'Campaigns' and 'Streets', based on Proximities and Demographic Types. Campaigns are embedded in the Map. Houses on the street are counted. Starting and Ending points are marked to facilitate the on-site data collection. The data collection report is integrated with the Route Map for documentation. Daily, after the on-site data collection, the Contractor sends a report to the Franchisee and the Company. A brief is sent to the Client, if agreed via SMS/ E-mail with the Campaign and the street data have been collected. The entire team can keep an eye on the data collection process, especially for map integrated, objective oriented and feedback based data collection. Our documentation is DDI Metadata by the standard in .xlsx files. However, we share data in .txt, .rtf, .pdf formats. The Franchise and their team document the collected data on a daily basis. We use the latest tools to process our data to keep it as flexible as we can, that it can be mined at the best way possible. We undertake in-house Data Documentation exclusively for our clients on separate terms and conditions. Our franchises/ supervisors conduct backchecking at random targets in the selected streets to confirm that Data collection has been taking place. Back Checking will be done mostly on the same day or within 3 working days. We can hand over the Back check details to the client if it has been agreed with the client. We do not use a third party back checking service over the phone. It imparts a better accountability. The Franchisee conduct an inspection on their own for any discrepency noticed and initiate the data formatting, data sorting, removing duplicate data, data correction, data enrichment, contact discovery, data accuracy validation and data privacy compliance verification. Once the verification has been done, the data is archived for sharing. After the safety checkings, the data files are transfered. Each Data Collection campaign is unique. Time, environment and mindsets act heavily on consumer behaviour. Let's sit for a chat. A brainstorming session might save us a lot of time, effort and money. From Assessment, Collection, validation, documentation to sharing we need to reserve room for improvement! Collective experience, views, suggestions and solutions are shared mutually to strategise future Data Collection Campaigns. Please Decide the territory and plan the method of service you need for Data Collection Campaign and contact us for the pricing. See the Price List above for Data Sharing services. 1.) By booking a Data Collection Campaign also mean that the material to be distributed for collecting the data does not contain anything which is dangerous, constitutes an infringement of copyright, or is defamatory, obscene or otherwise illegal. 2.) All necessary authority and permission has been secured in respect of the use in the leaflet of pictorial representations of (or purporting to be of) living persons and of words attributed to living persons. 3.) Copy shall be legal, decent, honest and truthful, shall comply with the British code of Advertising Practise or British Code of Sales Promotion Practise and all other codes under the general supervision of the Advertising Standards Authority. Intrilo Business Services reserves the right to require copy to be amended to meet its approval and to omit or suspend the distribution of any leaflet as its sole discretion. The Client agrees to indemnify Intrilo Business Services in respect of all costs, damages or other charges falling upon the Company as the result of legal action or threatened legal action arising from the publication and/or distribution of the leaflet. Material for distribution shall be delivered to the Intrilo 'Business Address' given, earlier than 2 working days prior to the commencement of the distribution. Material can be picked up from within the Inverness area at a rate of £5 per trip. Cancellations must be notified to the Company via email or Text Message seven working days prior to the distribution date. Cancellations for the orders not notified within the required time period will be charged at a rate of 50% of the value of the original order. We will try our best to Carry on with the data Collection Campaign on the day it has been booked to. However considering the weather or force majure conditions, if it couldn't be carried out, it will be notified to the customer in writing and over the phone, that the distribution can be done on the newly agreed or the nearest possible day. If the campaign terminated by any aforesaid conditions, the company is not liable for any form of compensation. However, the material will be returned and the Payment will be reinbursed. Full payment must be received at the time of booking. Credit terms, if any, agreed are strictly for 7 days from the date of the invoice. All payments must be made in the Inrilo Bank A/C details given in the header of the Quote/Invoice. © 2013-2017 www.intrilo.co.uk. All Rights Reserved.